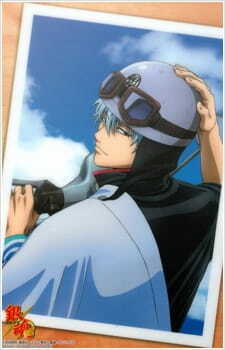 According to Tsutaya Online, the DVD of Gintama: Shinyaku Benizakura-hen will be released on December 15th. A new special will be bundled with the limited edition. It's the running gag of Ben Johnson episode where animation staff reuse the New Years footage; Yorozuya would sit around the kotatsu eating a bowl of tangerines. They discuss elaborate subjects, Shinpachi complains about reusing animation footage, and then Gin-chan always ending the gag with a pointless announcement. This is about a big announcement. A very big announcement, indeed. But, that is subjective, and the more energetic members of the Yorozuya can't possibly agree on the impact it would have, on either the audience or themselves. That is, of course, after the subjective appraisal of time passing, which, as they admit, is like a stuck record. This effectively is an introduction to Gintama', but doesn't actually have anything to do with the Benizakura arc. It ends with trailers from the following episodes, but other than that the meta-reflection and ruminations permeate the narrative.